Canada’s longest-running new works festival returns for a 40th year. Rhubarb transforms Buddies into a hotbed of experimentation, with artists exploring new possibilities in theatre, dance, music, and performance art. Rhubarb is the place to see the most adventurous ideas in performance and to catch your favourite artists venturing into uncharted territory. Rhubarb is a space for artists and audiences to experiment together by trying new things and testing their boundaries. 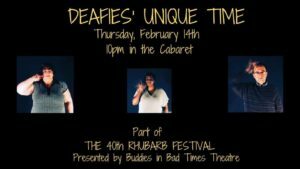 SURTITLING/ASL On Thursday, February 14, three of the evening’s Rhubarb shows will be presented with surtitles in English: – 8:00 PM – How was your day, honey? | The Rhubarb Festival – 8:30 PM – The BiG SiSSY Show: The Message | The Rhubarb Festival – 9:00 PM – Temple of the Divine Queer | The Rhubarb Festival The evening’s special presentation (Deafies’ Unique Time) is performed entirely in ASL. 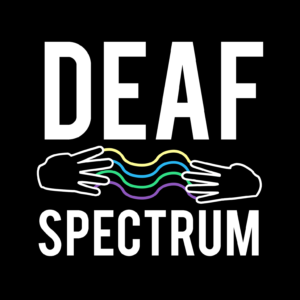 D/deaf and hard of hearing can book $5 tickets ahead of time using the code “ASL5” at checkout, or purchase pay-what-you-can tickets at the door. 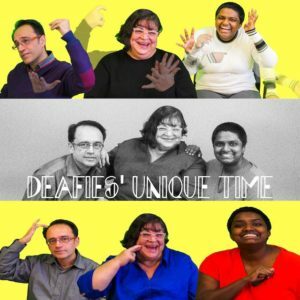 Three BIPOC Deaf artists weave together their diverse backgrounds into a theatrical experience you won’t want to miss. Performed in ASL with English subtitling. You can buy your tickets online on the Buddies in Bad Times website and use the promotions code ASL5 to get a 5$ ticket for the evening! On February 14th, ASL Interpretation will be provided at the Box Office and Bar.